(plural Chi·ca·nos) noun Hispanic Mexican American man: a North American man or boy of Mexican descent (sometimes offensive) [Mid-20th century. 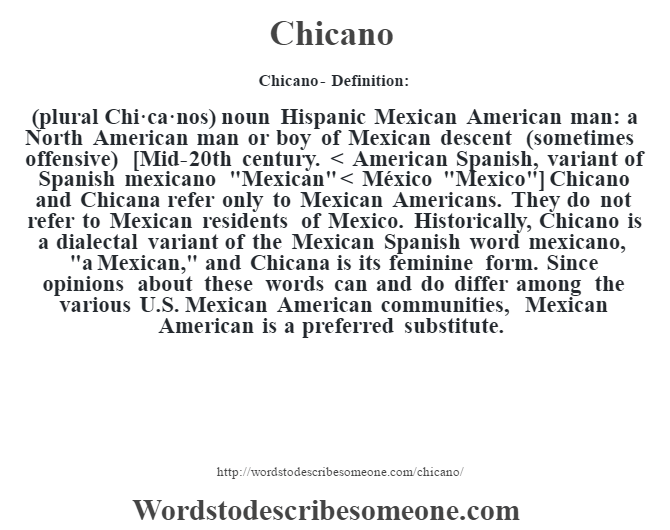 < American Spanish, variant of Spanish mexicano "Mexican" < México "Mexico"] Chicano and Chicana refer only to Mexican Americans. They do not refer to Mexican residents of Mexico. Historically, Chicano is a dialectal variant of the Mexican Spanish word mexicano, "a Mexican," and Chicana is its feminine form. Since opinions about these words can and do differ among the various U.S. Mexican American communities, Mexican American is a preferred substitute.